Indeed, the shower is one of the places where one can feel most vulnerable. Many keep a sidearm in reach most of the time but are unarmed when bathing. Worse, the loud shower prevents one from knowing who may lurk unexpectedly near by. It is no wonder that horror movies often involve the victim being in the shower. While one may often find ridicule trying to discuss shower defense options, I believe it is a discussion worth having. Perhaps the best example of bathing defense done right is from The Good, the Bad, and The Ugly. The classic bathtub battle scene can be seen here. If it wasn't for Clint Eastwood keeping his revolver handy in the bath he may not have made it out of that scene! One of the first and most important steps to shower defense is to lock doors. Lock the door of your house if possible, and of the bathroom door. Regardless of your shower defense plan, that critical second it might take for someone to break the door down could be essential to your preparation in self-defense. One of the primary reasons a person is typically unarmed when bathing is that weapons tend to be made of metal and water tends to corrode metal. One possible defensive implement could be a knife made from plastic. Cold Steel has a line of knives they call the nightshade series. They do not really have a sharp edge that you can slice with, but they are pointy and make a far better weapon than bare hands. My favorite is the FGX Tai Pan knife. It has a small hole in the handle so you can attach it to a hook in your shower. Of course, I believe that a handgun is a superior weapon to a knife. The problem is that practically all guns contain parts that could rust if exposed to water. Even a stainless steel gun probably has small springs that are not stainless steel. While one could bring a firearm into the shower, this might necessitate taking the weapon apart afterwards to dry it out. For most people, this would be an unreasonable use of time. Some have been known to keep a firearm outside the shower itself but in the bathroom. This prevents direct contact with water but the humid environment still might not be ideal for a firearm. Also, if someone were to break down the bathroom door or just barge in if it was not locked, access to the firearm could be compromised. One potential method is to have a shower defense box set up. 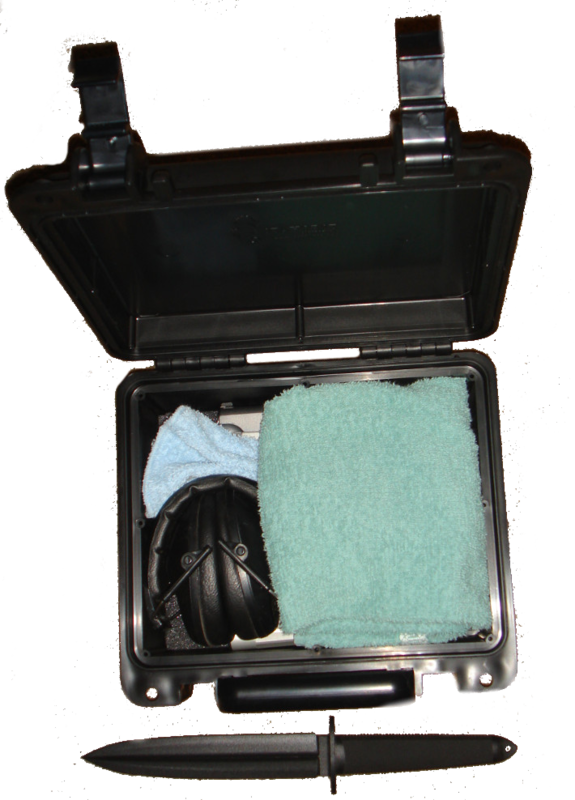 The shower defense box is a waterproof box that you can store a firearm and other useful defensive tools in. It is a box that can be kept on the inside of the shower curtains. Because the box has to be opened before it can be used, it is essential that it is used in conjunction with a locked bathroom door. I also recommend a waterproof stabbing implement not located in the box in case there is not time to access the box. 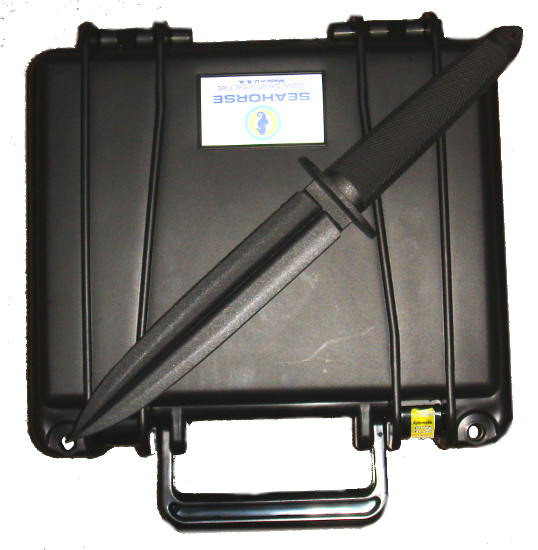 This is an example of a shower defense box, as well as a Cold Steel FGX Tai Pan non-metallic knife. The box is a Seahorse SE-300 waterproof case with the foam removed. Removing the foam increases the volume inside the box. It is important to verify the water tightness of any box you choose. I had first tested a Plano "Water-Resistant" ammo box and found that pouring water over the lid when closed would cause water to get inside. 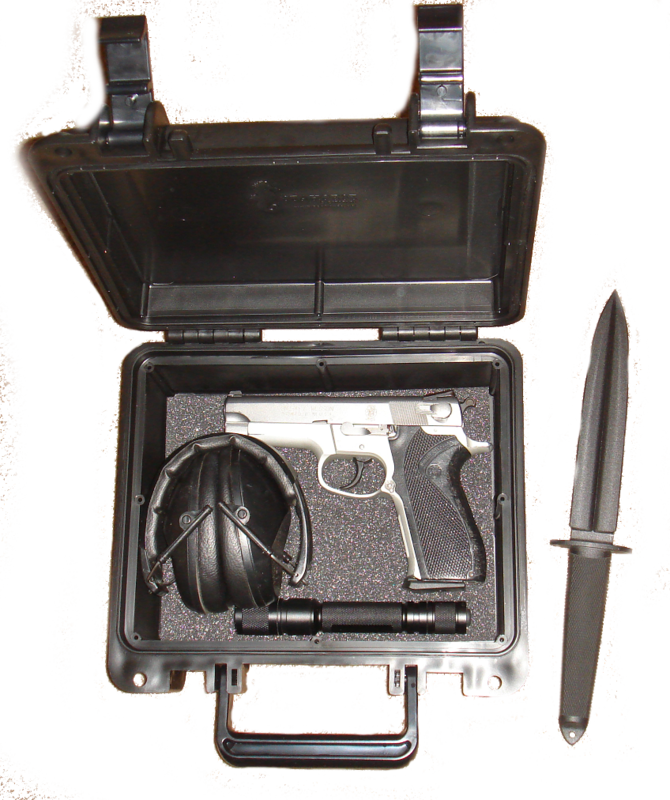 This box is outfitted with an S&W 5903 9mm Semi-Automatic pistol. This particular example was a police trade-in model that was acquired at a great discount. It has a stainless steel slide and barrel and an aluminum frame which helps with corrosion resistance, although I have found the Seahorse SE-300 case to be completely waterproof in my tests. I purchased an aftermarket Mec-Gar 17 round flush fit magazine to replace the 15 round magazine the 5903 came with, which was ironically rusty when I got it. Also, in the case, I have placed some ear muffs and a flashlight. The pictured flashlight is the Fenix E21. There may not be time for these to be useful if the shower was suddenly ambushed, but if you hear strange noises and have a dark house, you might not have any tools at your disposal except what you brought with you. Because there is no foam to keep things from bumping each other, and because your hands may be wet, you can keep the items in the box separated with small hand towels that you could also use to quickly dry your hands if needed. In this picture, the Fenix E21 is replaced with an Inova X5 flashlight.